that Moses the murderer was fleeing for his life. despite the light and heat that so obviously emanated from it. He must have thought that he was out of his mind. and this God was going to lead his people out of slavery. The word ‘grace’ can have a number of different meanings. adroitly handle themselves in public. and take us by surprise with kindness. what should have been done earlier. with the greenery and the candles and the poinsettias. We are graced with the music of the organ and the choir. 'The birth of Jesus is more than a commemoration of his birthday. His birth into this world prefigures the birth into the next world of his martyrs, who follow in his train. The birth of Christ is a judgment on the persecution and rejection of God and his word, and means joy for those who remain faithful and steadfast even in the face of great persecution. These are days of judgment as well as joy. 'On what in Germany is called 'second Christmas day,' the church celebrates another birth, the birth into heaven of Stephen, the first Christian martyr. His feast day is yet another way of declaring the church's confidence that the outcome of the Christian struggle is certain. It is a further testimony to the kingdom made ready for God's epople, prepared now for those who would 'take it by force' (Matt. 11:12). today, we light another candle on the Advent wreath. we are given more and more glimpses of the day of rejoicing to come. they still resound with the themes of Christ. in the style of a good historian. Pontius Pilate, and Herod Antipas and Philip and Lysanias. advised by the last high priest, his father, Annas. he told me about a couple who had recently joined. because they both work at Wal-Mart. but because it’s the busiest day of the week. If you are in the Pittsburgh area, I recommend a trip here. Such a wonderful and peaceful place. Here are some photos from our recent group outing. Please join us as John Peter Kirubagaran, founder and executive director of United Evangelical Mission/India, visits us at St Stephen Lutheran Church. He is visiting the United States to meet with partner congregations all around North America. We are welcoming him at 7 p.m. this evening. We hope to see you there! 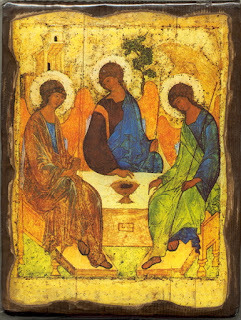 It is very appropriate that the feast honoring the Holy Trinity occurs the Sunday after Pentecost. On Pentecost we heard Jesus’ promise that the Holy Spirit would guide the disciples ‘into all truth.’ In the early centuries of the Church, God’s people examined the Scripture and meditated upon the Lordship of Jesus and his prayer to his Father. In examining Scriptures such as the ones we will read today, the Church was guided by the Holy Spirit into the mystery of the Trinity – one God in three persons, the Son being made human for the sake of the world. We confess the Athanasian Creed every Trinity Sunday. This creed was first used in the early sixth century. It can be intimidating because of its length and because of the condemnations of those who do not hold to the Trinitarian faith. However, these very condemnations indicate just how important the Church believes faith in the Trinity to be. These three persons share one divine essence or ‘being,’ and in their unity of love are coeternal and coequal. For if the Son of God is truly eternal with his Father, begotten, not made, then in his incarnation God himself has entered into our existence: in Jesus, God himself has become a human being and lived a human life. Some believed that God could not become a human being, and even among those who did, there was disagreement about the particular mode of his humanity. Were these disagreements mere theological hair-splitting? Not according to the Church, which held to the argument ‘What has not been assumed cannot be redeemed.’ If God the Son does not assume humanity, then his obedience to his Father and his acceptance of death do not count for us. But if Jesus takes up humanity for the world’s sake, then we are truly brought into his eternal life and given a share in the Spirit which he shares with the Father. We too may pray to his heavenly ‘Abba,’ his Father, believing that we are his children and Christ's brothers or sisters. Do we have trouble understanding the mystery of the Holy Trinity, or do we have doubts? Does this mean we are among those who are ‘condemned?’ We take comfort in the fact that even the most learned and subtle theologians of the Church cannot fully exhaust or understand God’s mystery. I personally agree with Pastor Frank Senn, a renowned historian of creeds and liturgy, who writes that a lack of full understanding is not what is condemned in the Creed. Rather, it is the outright rejection of the Trinitarian faith by those who do understand it (perhaps especially by theologians responsible for teaching the faithful) which is condemned. We welcome Brother John Peter Kuribagaran from India! Tuesday, June 2, 7:00 p.m.
United Evangelical Mission/India was founded in 1988. To this date, John Peter and his staff have reached 6.4 million people with the Gospel through a Community Transformation Center model. 1,212 church planters have established 950 churches in India, Sri Lanka, Nepal and Indonesia. 992 women have graduated from the "Talitha Cumi" women's empowerment program. Twelve children's homes and community-based childcare centers now serve over 800 children. Denominational partnerships include the Church of South India (Anglican), the India Evangelical Lutheran Church, Tamil Evangelical Lutheran Church, Assemblies of God, Baptist, and independent non-denominational. Please join us as we welcome Brother John Peter and hear his presentation about the ministry and mission of UEMI. and he is seated at the right hand of the Father. Jesus sitting on a lower throne. Truth be told, it’s hard to get rid of that image. until I see God face-to-face.